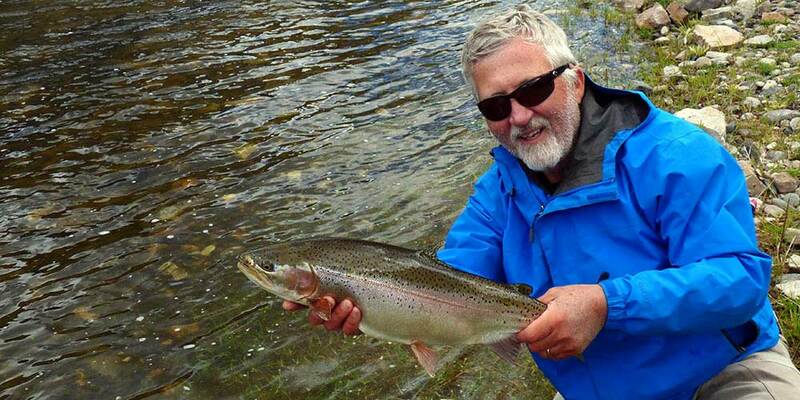 This beautiful rainbow ate a sowbug pattern in late May. Just look at that head! Please Note: We are not offering power boat trips during the 2019 season, which is why this page does not show up if you use the navigation structure above. The reason we didn't take the page down completely is that we plan to resume offering power boat trips, including on a wider range of waters, in 2020. Walter just had to sell his power boat to afford a down payment on a house in fall 2018, but expects to replace it in fall 2019. If you found this page through a web search, please keep us in mind for power boat trips in the future. Does the name "Land of the Giants" sound evocative? It should. This short section of the Missouri River is home to the largest trout in the Parks' Fly Shop area of operations. We didn't coin the name, but it's well-earned. 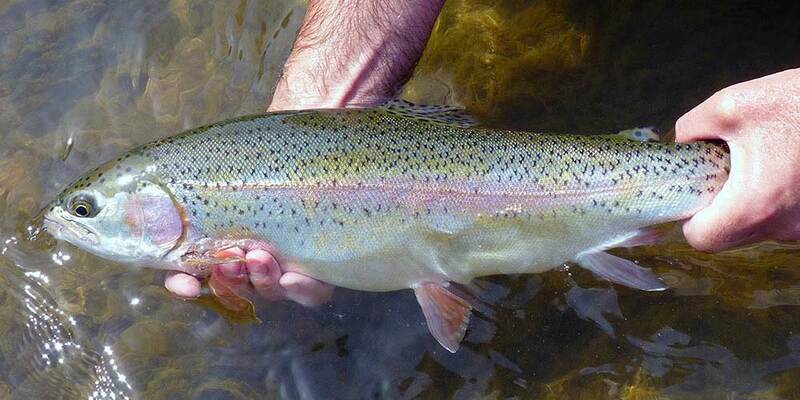 Most rainbow trout caught here range from 14-20 inches, and many fish will be even bigger. Except during the peak spawn period, these are also rock-solid, fat, powerful fish that will almost make your reel smoke. Access to this section of river is difficult. There's no boat ramp at the upstream end and the river is constrained by a roadless canyon, so the only boat access is by motoring up from Holter Lake in a boat powered by a jet outboard. Guiding on this water via motorboat requires a US Coast Guard captain's license, which less than 1% of Montana fly fishing guides possess. PFS Head Guide Walter Wiese is one of these guides, and we're VERY EAGER to offer power boat trips on this exceptional piece of water. We often see a dozen or more fish per day in this size bracket per day at Land of the Giants, along with some bigger ones, though this one was extra pretty. The Land of Giants section of the Missouri is at its best from March through early July. From March through the middle of May, trout from Holter Reservoir downstream run up into the river on their spawning runs, increasing fish numbers into the stratosphere, while from mid-May until early July these same fish hang around gorging on the smorgasbord of aquatic food available here. Fishing gets tougher for the remainder of the season. It can still be good, and crowds actually drop in late summer and early fall rather than increasing as they do elsewhere. While there's some dry fly fishing, the bulk of the fishing is subsurface. In early spring, when the fish are fixated on eggs, nymphing with egg patterns and nymphs that resemble mayflies, midges, or scuds but also push the egg "button" are the top tickets. As the fish begin to shift off eggs, sowbugs, scuds, and BWO and PMD nymphs are better bets, and if the river is high, large San Juan Worms are also excellent choices. By mid-June, PMD nymphs and caddis larvae and pupae are the tickets. They remain the best options until fall, when BWO nymphs take over again. 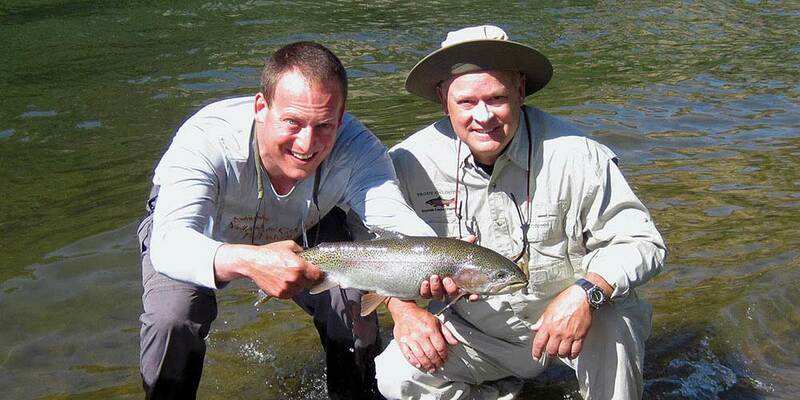 Streamers can work throughout the season and typically produce the largest fish. Regardless of time of year, fishing Land of the Giants is different from standard river float trips. The trip begins with a beautiful run upstream from Holter Lake, at the upstream end of the famous Gates of the Mountains. The river enters the southern side of the lake and is often slow and lazy, so much of the time we will anchor and fish a run thoroughly, something that seldom works well on the Yellowstone. In addition, the motor makes it possible to repeatedly run upriver, so even when drift-fishing, we jump upstream several times to hit the best water again and again. In regards to flies and tackle: while the fish are bigger here than anywhere else Parks' Fly Shop guides, most of the flies these big fish like to eat are smaller than most we use, so you can expect plenty of breakoffs and long, epic fights on light tippets. Suffice it to say, this isn't a place for the faint-of-heart or for rookies. For intermediate to expert anglers who are interested in doing something different and catching some seriously large trout, it's a great bet. Because this water is a long way from our shop, we give significant discounts for multi-day bookings to the Land of Giants, planning to stay overnight in Helena. We realize the overall price of fishing here is high, but it needs to be due to the specialized boat and licensing required; our rates are very competitive with those of our competitors, especially early and late in the season and when we fish for multiple days.